The primary objective of the Feed the Future Enabling Environment for Food Security project is to support the Feed the Future Initiative to address enabling environment factors that affect food security outcomes, including but not limited to legal, institutional, and market constraints within the food system. The project works with USAID Missions and Washington offices across the program cycle through tailored analysis, institutional strengthening, capacity building, stakeholder engagement, and strategic knowledge management (KM) services. This 2018 Mali Value Chain Commercial, Legal, and Institutional Reform (VcCLIR) assessment revisits selected recommendations from a 2011 VcCLIR consisting of a qualitative analysis of the enabling environment focused on the livestock, rice, millet, and sorghum value chains. This brief synthesizes publicly available and regularly updated data on Ethiopia related to four key trade determinants that are actionable at the national level. This brief synthesizes publicly available and regularly updated data on Uganda related to four key trade determinants that are actionable at the national level. This brief synthesizes publicly available and regularly updated data on Senegal related to four key trade determinants that are actionable at the national level. This brief synthesizes publicly available and regularly updated data on Nigeria related to four key trade determinants that are actionable at the national level. This brief synthesizes publicly available and regularly updated data on Niger related to four key trade determinants that are actionable at the national level. This brief synthesizes publicly available and regularly updated data on Kenya related to four key trade determinants that are actionable at the national level. Launched in October 2015, the Feed the Future Enabling Environment for Food Security project has a period of performance of up to five years. Through this flexible contracting mechanism, USAID Missions and Washington offices can access tailored technical assistance and expertise to inform local solutions and address strategic priorities related to improving enabling environments for food security. The mechanism is coordinated by USAID’s Bureau for Food Security and implemented by Fintrac Inc. with sub-contractors Cultural Practice and The CloudBurst Group. To learn more, click here or contact Nate Kline (Chief of Party) at nkline@fintrac.com(link sends e-mail) or Lourdes Martinez Romero (COR) at lmartinezromero@usaid.gov (link sends email). Other donors, implementers, researchers, private sector agriculture businesses can collaborate with us to grow the evidence base and further the state of practice on enabling environment reforms for improved food security. Have an example of work you’d like to share? Want to stay informed of ours and other Feed the Future related developments around good practices to improve the enabling environment for food security? Email us at eefs@fintrac.com (link sends e-mail). 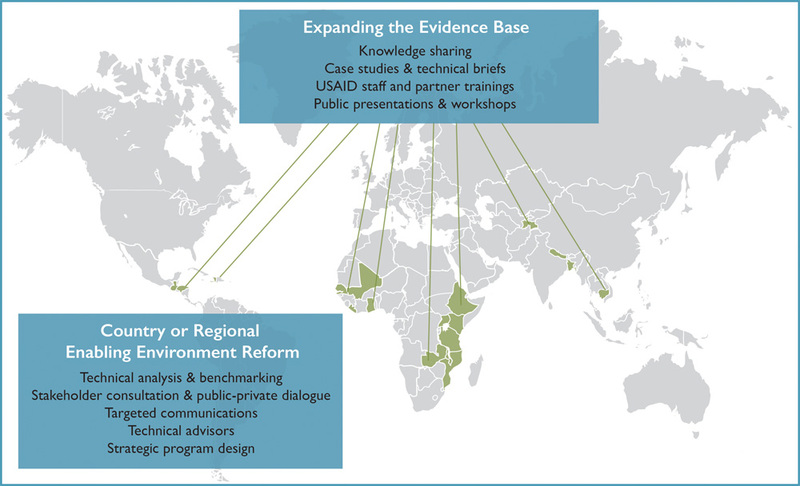 Providing technical analysis and advisory support to reform processes, and across program life cycles, at regional, national, and sub-national levels. Expanding the evidence base and promoting exchange of good practices around achieving sustainable improvements in food security through enabling environment reform. The project works in consultation with diverse stakeholder groups to leverage their experience and collaborate in support of enabling environment reform, including the private sector, local government officials, civil society, research institutions, existing projects, and other donors. Enabling the Business of Agriculture in Support of the GFSS (2019) — Through self-paced modules, audiences will learn about the World Bank’s Enabling the Business of Agriculture (EBA) Index as well as specific analytical strategies to use EBA data in programming to support the U.S. Government’s Global Food Security Strategy. The Intra-African Agriculture Trade Improvement Scorecards (2018) — The Intra-African Agriculture Trade Improvement Scorecards capture relative performance on a range of elements that underpin an effective trading system for agriculture, providing data and analysis actionable at both at the regional and country levels. Bilateral scorecards include Ethiopia, Ghana, Kenya, Mali, Niger, Nigeria, Senegal, and Uganda. Regional scorecards include East Africa, Southern Africa, and West Africa. Private Sector Voices: Building an Enabling Environment for Investment (2018) — This study examines what works well for integrating smallholder farmers into market systems through the private sector, and how can we better understand how the enabling environment impacts business decisions — positively or negatively — as they engage smallholder farmers. Increasing Women’s Profitable Participation in Market Systems Technical Note (2018) — This note examines the role of the enabling environment in supporting women agri-entrepreneurs and agricultural wage workers. Constraints to Accessing Finance and Insurance in Mali’s Livestock Sector (2018) — This report analyzes the sectoral, policy, legal, and institutional barriers to expanding access to credit and index insurance in the livestock sub-sector in Mali. Monitoring and Evaluation Within Market Systems Development: Literature Review Summary Report (2018) — This report highlights insights and information from a literature review exploring how a strengthened market system is measured and how market system approaches maximize indirect impacts. Policy Data Snapshots (2018) — View selected policy data most relevant to each country's Feed the Future work Bangladesh, Cambodia, Ethiopia, Ghana, Haiti, Kenya, Liberia, Malawi, Mali, Mozambique, Nepal, Nigeria, Rwanda, Senegal, Tajikistan, Tanzania, Uganda, and Zambia. The Enabling Environment in Market Systems Technical Note (2018) — This technical note explores the role of the enabling environment in agricultural market systems, tools and best practices for enabling environment reforms, and methods for catalyzing reforms. Plant Protection EBA Data in Action Technical Brief (2018) — This brief outlines how to mitigate and address Fall Armyworm in Africa, synthesizing plant protection data via the 2017 World Bank Enabling the Business of Agriculture Index to identify opportunities to strengthen the plant protection regulatory environment in sub-Saharan Africa. EBA Trade Basics Technical Note (2018) — The EBA Trade Basics note outlines the Enabling the Business of Agriculture indicators related to trade, including seed, markets, fertilizer, machinery, and transport. It highlights available trade indicators at the country level. Alternatives to Full-Service National-Level Commodity Exchanges: Case Studies on ASERCA and PXAfrica (2018) — This report profiles two alternative models to high-profile commodity exchanges: the ASERCA program and the PXAfrica trading platform. Where conditions do not support a full-service national-level commodity exchange, these alternatives can achieve similar market objectives. EBA Markets Scoring Technical Note (2018) — This scoring note illustrates how practitioners may use the Enabling the Business of Agriculture markets indicators to benchmark and monitor performance against U.S. Global Food Security Strategy goals. Seed EBA Data in Action Technical Brief (2018) — This technical note explores the World Bank 2017 Enabling the Business of Agriculture seed data and its relevance to the Southern Africa Development Community efforts to harmonize seed regulations. Gender EBA Data in Action Technical Brief (2018) — This brief takes a close look at gender indicators in the 2017 Enabling the Business of Agriculture Index and synthesizes areas covered by the data that can be used to inform inclusive agriculture-led growth in support of the U.S. Government’s Global Food Security Strategy. Ghana AgCLIR Summary and Recommendations (2017) — This document summarizes key findings and recommendations from the Ghana Agribusiness Commercial, Legal, and Institutional Reform (AgCLIR) report, which examines the legal, institutional, and social environment for doing business in Ghana’s agricultural sector. Ghana Agribusiness Commercial, Legal, and Institutional Reform (AgCLIR) Full Report (2017) — This report addresses the legal, institutional, and social environment for doing business in Ghana’s agricultural sector. It aims to inform strategies and decisions by government institutions, donors, NGOs, and the private sector in developing agricultural enterprise and economic growth. Assessing the Preconditions for Commodity Exchange Success: A Guidance Document (2017) — This guidance document presents potential benefits and limitations of commodity exchanges, the conditions for their success (including lessons learned from various countries), and alternative solutions to achieve similar objectives. Distance to the Frontier (DTF) Scoring Basics for EBA Technical Note (2017) — This technical resource provides short explanations to several common questions about the EBA “Distance to the Frontier” scoring system. The goal is to help make it easier to understand what the data is measuring and better assess what it means in different contexts. An Analysis of Enabling Environment Reform Under Feed the Future (2016) — This comprehensive analysis examines program design approaches, key methods of engagement, and priority policy areas to better understand what has been effective, common challenges, and lessons learned in the first five years of Feed the Future. Southern Africa Regional Seed Sector Assessment (2016) — This study documents findings regarding the relevant laws and institutions that govern the seed sector to better understand the status of compliance with regional seed harmonization efforts in the Southern Africa Development Community and to provide actionable recommendations to support more effective implementation of regional commitments. A Guide to Enabling the Business of Agriculture (2016) — Initially designed as a resource for USAID staff, this guide aims to identify key questions and considerations for utilizing the World Bank's Enabling the Business of Agriculture data to support Feed the Future efforts.